It’s almost Friday! I could use a drink. AGAIN! At least it’s not as bad as Tuesday’s wager. In fact, I’d argue that Ivan’s wager is even worse, since he has no chance of winning unless the other two miss anyway. Sorry – got a bit ahead of myself. If Adrienne doubles her score, she’ll have 31,400. 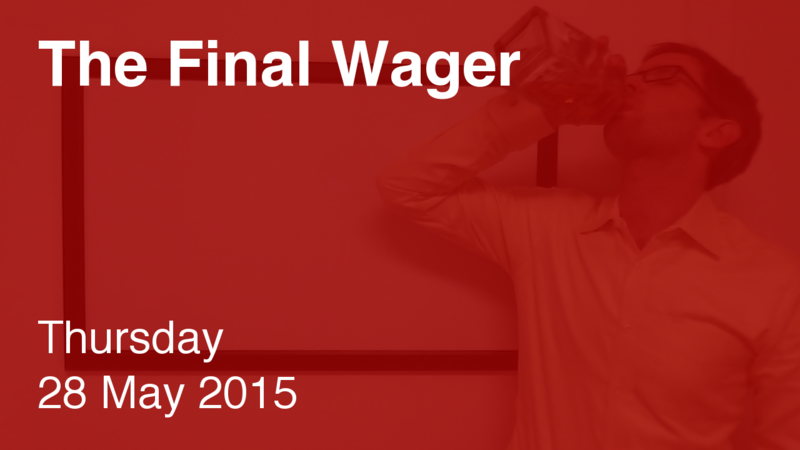 To cover this all-in wager, Dan will need to wager 11,400. An incorrect response with that wager will leave Dan with 8,600. To stay above his total, Adrienne can wager up to 7,100. Ivan can wager up to 6,600. A successful doubling will put Ivan at 30,400. To cover this, Adrienne should wager at least 14,700. In this case, though, she will lose on an incorrect response, so she might as well wager everything. I’m unconcerned about Dan here – might as well cover Adrienne. If Ivan wagers 6,600, Adrienne can cover him with 6,100. 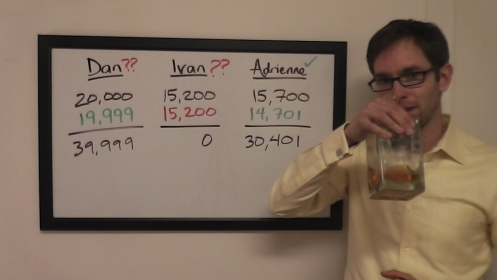 An incorrect response with that wager will leave Adrienne with 6,100, so Ivan should cap his at 5,600. If for some reason Dan wants to put his life in the hands of his opponents, he can go for at least 1,800 (which would cover both maximum wagers except Adrienne’s proper cover bet). Dan has now won 3 games and $85,598.